In a large electric skillet, heat oil over medium heat. Cook onion until tender, but not brown. Add remaining ingredients, except lettuce. Simmer 5 minutes, stirring occasionally. 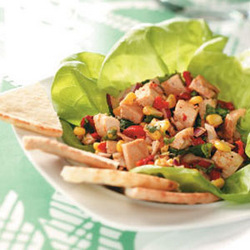 Serve chicken mixture over shredded lettuce.